Preheat oven to 350 degrees F and place rack in center of oven. Have ready an ungreased 2-piece 10 inch tube pan. Separate the cold eggs, placing the yolks in one bowl and the whites in another bowl. Cover the bowls with plastic wrap and bring the eggs to room temperature, about 30 minutes. Meanwhile, sift or whisk the sifted flour with the baking powder and salt. Set aside. Place the egg yolks and 2/3 cup of the sugar in the bowl of your electric mixer, fitted with the paddle attachment. Beat on high speed until they are thick, fluffy and light colored (when you slowly raise the beater, the batter will fall back into the bowl in a slow ribbon). Then, beat in the vanilla extract, water, and lemon zest. Set aside while you beat the egg whites. In a clean bowl, with a whisk, whip the egg whites until foamy. Add the cream of tartar and continue beating until soft peaks form. Gradually add the 1/3 cup of sugar and continue beating until the egg whites are shiny and just form stiff peaks. 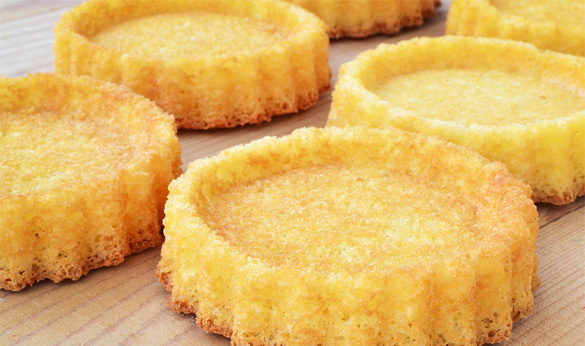 Bake in preheated oven for 28-35 minutes or until a toothpick inserted into the center of the cake comes out clean. Remove from oven and immediately invert the pan (turn upside down) and suspend it by placing the inner tube on the top of a flat topped glass or bowl. Allow the cake to cool completely before unmolding, about one hour. Run a flat metal spatula or sharp knife around the inside of the pan and then remove the center core of the pan. Run the spatula along the bottom and center core of the pan. Invert the cake onto a greased wire rack. The cake can be served plain with a dusting of powdered sugar or with fresh fruit and softly whipped cream. This cake can be covered and stored for a few days, or it can be frozen.